Pohnpei offers possibly the most diverse scenery among the islands of Micronesia and is considered by many to be the most beautiful. 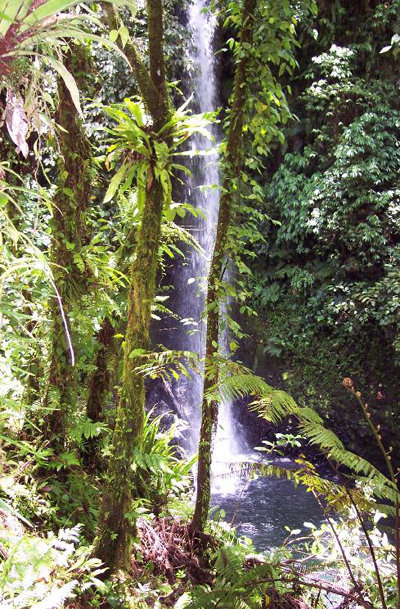 A large amount of rainfall feeds rushing rivers and tranquil freshwater pools, as well as some of the most spectacular waterfalls in Micronesia. The many reefs of Pohnpei give divers an opportunity to see a variety of sea life, including turtles, manta rays, and a myriad of tropical fish. Pohnpei also displays some of the most beautiful coral formations in the world, including the exotic black coral. 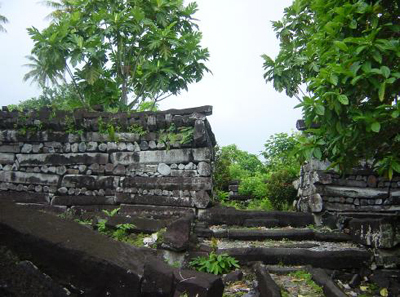 Enjoy a fascinating tour of the ancient city of Nan Madol, said to be over 700 years old. This Venice-like community complete with canals, stone towers and bridges, is Micronesia’s most famous ruin. If you love secluded sandy beaches, coconut palms and clear blue water, a day trip to Ant Atoll (pictured above) is a must. Pohnpei boasts pristine coral reefs and 10-15 foot manta rays, as well as multitudes of large and small fish and quite a few critters. Dive boats leave The Village at 9:30am. Two dives a day are scheduled. Depending on your dive schedule, lunch may be provided during your surface interval. Beach towels and drinking water are provided on the boats. Eighty cuft aluminum tanks and weight belts are supplied. Some rental gear is available. 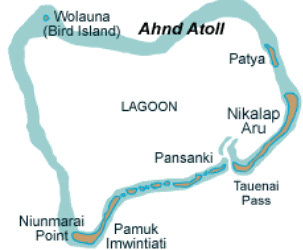 Day trips to Ant Atoll (above) are regularly scheduled. If you’re able to break away from the activity, you’ll observe that much of Mwand Pass is highlighted by corals, including branching green tubastrea, red whip coral, and soft coral trees in a variety of hues. Napoleon wrasse, schools of fusiliers and lots of small reef dwellers including nudibranchs, anthias, blennies and butterflyfish can be spotted here. This protected wall lies within the lagoon and is encrusted with sponges, tunicates and hard coral toward the top and soft coral, large gorgonians, and black coral trees at greater depths. A wide variety of tropical reef fish can be found here. One of the top dive sites in Pohnpei, this channel dive is frequented by a school of grey reef sharks, as well as by barracuda, napoleon wrasse and bumphead parrotfish. Lots of large corals on the upper reef and a variety of soft corals along the slopes provide a beautiful backdrop. For best visibility, dive this site during an incoming tide. A channel patrolled by black-tip, white-tip, and occasionally silver-tip sharks and a wall covered in golden sea fans, sponges, and anemones make Kehpara Island a worthy stop on your dive itinerary. The wall hosts some interesting critters, including lobster, shrimp, flatworms, and nudibranchs. The east and northeast sides of this island are frequented by green sea turtles, eagle rays, reef sharks, and schools of dog-tooth tuna and barracuda. 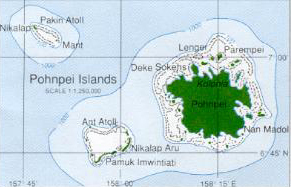 The island also features shallow coral gardens that are perfect for snorkeling. 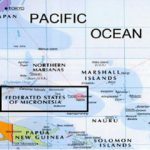 Located about midway between Honolulu and Manila, in the Federated States of Micronesia, Pohnpei is the greenest gem in the Eastern Carolines. It is an enchanted island shaped like a jagged circle and is full of lush jungle, waterfalls, and mist-covered mountain peaks. A coral reef surrounds this island paradise, sliced here and there by emerald passages that link the calm lagoon with the open sea. On the north coast, 15 minutes from Kolonia, is where you’ll find The Village. It’s hard to describe The Village in words. Even to call it a hotel seems strange. When you’re a guest here, it feels like a home away from home. You don’t stay at a hotel when you visit Pohnpei, you stay with the Arthurs. The Village itself consists of individual thatched-roof cottages made out of local materials and constructed using timeless Pohnpeian carpentry techniques. While the exterior would pass for an island chief’s house, the interior is far from primitive. Stepping inside these cottages, you’ll be pleasantly surprised by elegant bathrooms, oversized beds, white wicker furniture, whirling wooden fans and attractive island-print fabrics. Cottage categories are based on view. One single bungalow and two duplexes face the Sunrise and have bay views. Perched on the hillside, six single bungalows and one duplex enjoy views of Sokehs Island and the lagoon. Eight single bungalows are located on the Point and enjoy the quietest location as well as the best views. All bungalows are spacious and feature 2 queen size waterbeds with netting (mostly for tropical ambiance), white wicker furniture, closets, and hot showers. The Village’s imaginative bar and restaurant complex is the largest thatched-roof structure in all of Micronesia. 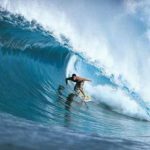 The name of the bar is ‘The Tattooed lrishman’ in honor of the legendary beachcomber who first introduced the outside world to Pohnpeian hospitality. The restaurant offers great food all day long. 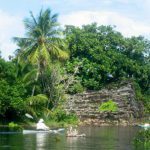 Tours include a visit to the ancient ruins of Nan Madol and breathtaking waterfall hikes. 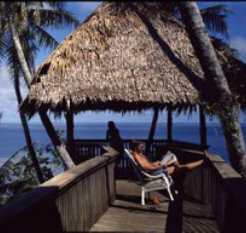 Enjoy sunbathing, snorkeling or just total relaxation in Pohnpei’s clear lagoons. The restaurant at The Village is known to be the best in town. The fresh seafood and meat dishes are 5 star quality, and all vegetables are locally grown. Top off your meal with Bananas Foster and the most sought after freshly brewed coffee on the island. The restaurant at the Cliff Rainbow Hotel offers American, Japanese, Pohnpeian, and even a few Italian dishes. Pizza or seafood spaghetti, anyone? If you just want a basic burger and fries, head to Angie’s Fast Food. Authentic Chinese cuisine with lots of fresh veggies! Coffee house meets karaoke bar. Snorkel the pristine coral reefs. 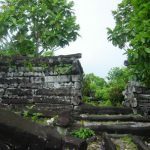 Tour the mysterious stone city of Nan Madol. 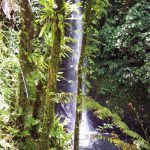 Take the “Six Waterfall Hike”. Be prepared to enjoy a freshwater swim. Enjoy a guided fishing trip inside the lagoon. 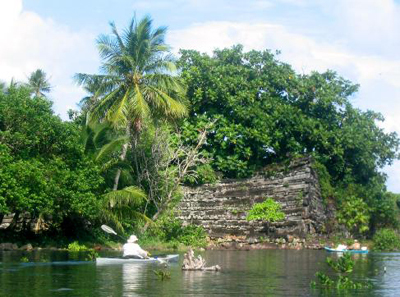 Glide through the mangrove forests and Nan Madol channels on kayak. Climb Sokehs Rock or hike to the top of Sokehs Ridge to see WWII relics. 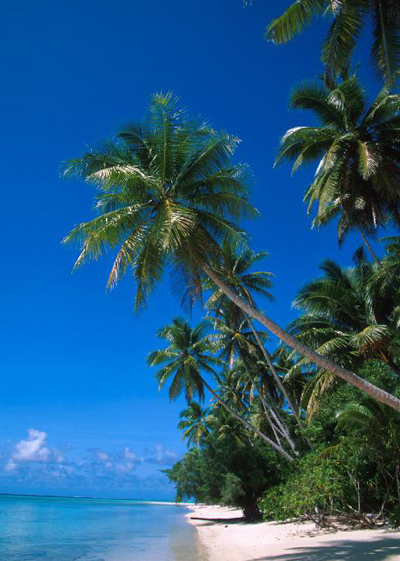 Relax on a beach….we recommend Ant Atoll! 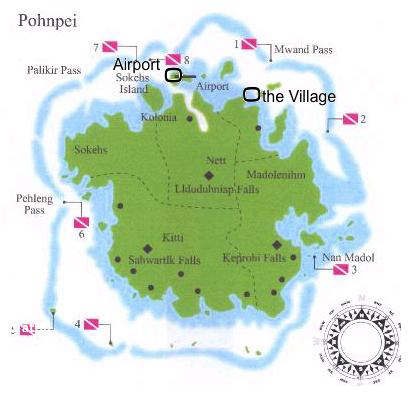 Pohnpei is one of the Federated States of Micronesia, located in the western Pacific Ocean. It lies north of the Solomons, southeast of Guam, and southwest of Honolulu. 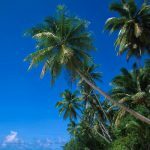 How long are the flights to Pohnpei? The actual flying time is about 15-16 hours, but your whole trip time will depend on the number of stopovers you have, or the kind of route you take. 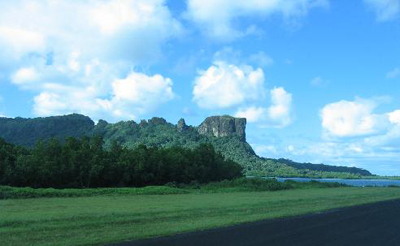 There is a route called the “Island Hopper” which will give you 3 more stops from Honolulu before reaching Pohnpei. The US dollar is Pohnpei’s official form of currency. There are 2 banks that serve Pohnpei, Bank of Guam and Bank of FSM. Both are located in Kolonia. The official language is English. The native Polynesian language is also still spoken locally. 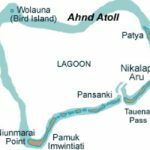 Pohnpei uses standard 110-120 volts (same as US). Please check with your airlines regarding luggage requirements and restrictions. 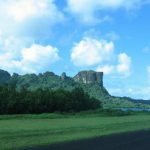 What airlines fly to Pohnpei? Will someone pick us up from the airport? Yes, The Village Hotel provides roundtrip airport transfers. 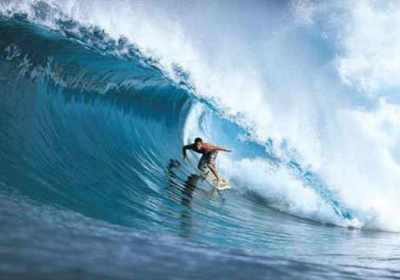 Walls, caverns, sharks, manta rays, turtles, hard and soft corals, critter dives and a large variety of reef fishes. When will my dive day start? Boats leave The Village at 9:30am. 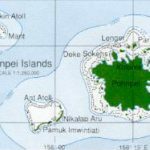 Pohnpei is 18 hours ahead of Los Angeles and 15 hours ahead of New York.